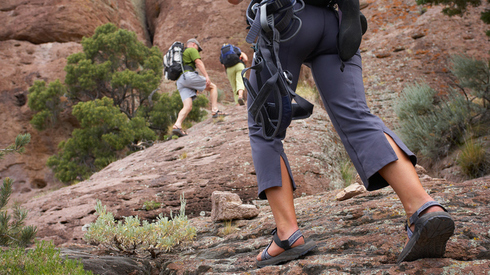 Eagle Pass is an easy loop trail from Needles that can be done in half a day. The loop follows part of the long East Mojave Heritage Trail, the full length of which is no longer open to vehicle travel. The trail leaves from the center of Needles and almost immediately travels along a loose, gravelly trail toward the Sacramento Mountains. It enters a canyon that climbs gently toward Eagle Pass. The towering bulk of Eagle Peak is immediately to the north. The vegetation is a mixture of sage, smoke trees, Mojave yuccas, chollas, and barrel cacti. Special Attractions: Rockhounding for jasper; Trail is part of the East Mojave Heritage Trail; Remote trail traveling along desert washes. High-clearance 4WDs are preferred, but any high-clearance vehicle is acceptable. Expect a rough road surface; mud and sand are possible but will be easily passable. You may encounter rocks up to 6 inches in diameter, a loose road surface, and shelf roads, though these will be wide enough for passing or will have adequate pull-offs. This short spur trail leads along a rutty trail to the remains of the Moss Mine. The major attraction is the mine, which has some interesting ruins of stone buildings, many adits and shafts, and a steel headframe. The ruins make an excellent subject for photographers. There are many side trails leading from Moss Mine and along some of the washes, and a keen explorer will be able to find one of several different routes through to Mossback Wash Trail. However, these un-mapped trails can be confusing to follow and it is easy to get bushed. Make sure you are carrying at least a topographic map and compass if you are planning to attempt any of these routes. Special Attractions: Extensive remains of Moss Mine; Access to a network of other 4WD trails; Can be combined with Mossback Wash Trail and Thumb Butte Trail to make a full day tour. High-clearance 4WDs are preferred, but any high-clearance vehicle is acceptable. Expect a rough road surface; mud and sand are possible but will be easily passable. You may encounter rocks up to 6 inches in diameter, a loose road surface, and shelf roads, though these will be wide enough for passing or will have adequate pull-offs. 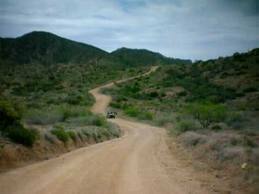 This trail combines a long, interesting drive, a short walk, and wide-ranging views. It leaves from the community of Golden Shores along a wide, graded (though often washboardy) road. The turnoff for the trail proper is 6.4 miles along this road. The turn is well used but very narrow, and with no marker it is easy to miss. If you come to a windmill, a stone tower, and a dwelling on the graded road, you have gone 1 mile too far. Special Attractions: Oatman Warm Springs; Trail running along the edge of the Warm Springs Wilderness; Far-reaching views of the Black and Mohave Mountains; Wildflower-viewing in spring. High-clearance 4WDs are preferred, but any high-clearance vehicle is acceptable. Expect a rough road surface; mud and sand are possible but will be easily passable. You may encounter rocks up to 6 inches in diameter, a loose road surface, and shelf roads, though these will be wide enough for passing or will have adequate pull-offs. This narrow, winding single track meanders through some spectacular Black Mountains scenery before dropping into Mossback Wash. It leaves from Thumb Butte Trail along a wash, before climbing out and winding its way over ridges, dropping often to cross through narrow gully washes. After 2.6 miles, the trail passes Mossback Mine, another of John Moss’s claims. The mine has large tailings heaps and adits. Nearby are caves reputed to be the hideout of some German prisoners of war from World War II who escaped from the camp in Kingman. Special Attractions: Viewing wild burros and bighorn sheep; Spectacular scenery in the Black Mountains; Mossback Mine and German Soldiers Caves. High-clearance 4WDs are recommended, though most stock SUVs are acceptable. Expect a rough road surface with rocks larger than 6 inches, but there will be a reasonable driving line available. 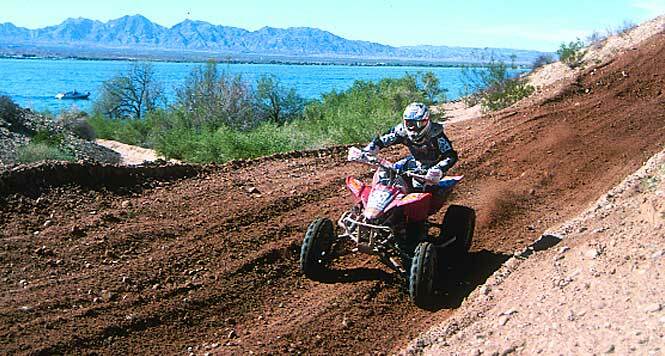 Patches of mud are possible but can be readily negotiated; sand may be deep and require lower tire pressures. There may be stream crossings up to 12 inches deep, substantial sections of single-lane shelf road, moderate grades, and sections of moderately loose road surface. This extremely pretty route takes the back country traveler along the western side of the Black Mountains, through rugged terrain, gravelly washes, and remnants of the mining era. The trail leaves Arizona 68 to the west of Union Pass on an unmarked but well-used gravel road, 19.5 miles west of Kingman. A series of turns leads to increasingly smaller and less traveled roads, passing around the distinctive rock spire of Thumb Butte. Special Attractions: Spectacular scenery in the Black Mountains; Old mine remains; Thumb Butte; Wild burros. High-clearance 4WDs are required. This trail has either a rough, rutted surface, rocks up to 9 inches, mud and deep sand that may be impassable for inexperienced drivers, or stream crossings up to 18 inches deep. Certain sections may be steep enough to cause traction problems, and you may encounter very narrow shelf roads with steep drop-offs and tight clearance between rocks or trees. This route roughly follows the original bed of the old Mohave and Milltown Railroad. A hiking trail follows the railroad route, while the four-wheel-drive route weaves back and forth across it. Look at the trail markers carefully to see whether they are for hikers or Jeeps. Most of this road is fairly flat and can be driven in a high-clearance two-wheel-drive vehicle. Four-wheel drive may be needed occasionally after heavy rains when ruts and washouts occur. The road is sometimes faint and difficult to find, especially at the west end. Use Boundary Cone as a directional landmark. The trail can also be driven in the opposite direction. The next time that you visit the Colorado River communities, be sure to get out on one of your favorite off-road trails and explore the beauty of Western Arizona. We encourage you to practice safety at all times and have fun! Thank you for visiting HomeSalesBullheadLaughlin.com. Browse the most current Colorado Riverfront Homes, and Condos listings for sale along Arizona's Colorado River. Call 1+951-264-5690 iPhone to Buy or Sell My House.